The alley runs between Arlington Street and Berkeley Street. I had forgotten about all the public alleys. Nice picture. It's perfect for black and white. Love the strong shapes in this. Ideal for a mono image. You've a good 'eye' to make such an impactful photo from unpromising beginnings. really like the composition here and the choice of b&w. Even ugly places can make funny pictures and beautyful photographies! If you're standing on the Arlington Street side of P.A. 438 looking West towards Berkeley St, it's a great vista with the small golden dome (don't know the name of the building but it's right across from 500 Boylston and has Boston Sports Clubs inside) perfectly centered in the background. It's a cool spot. 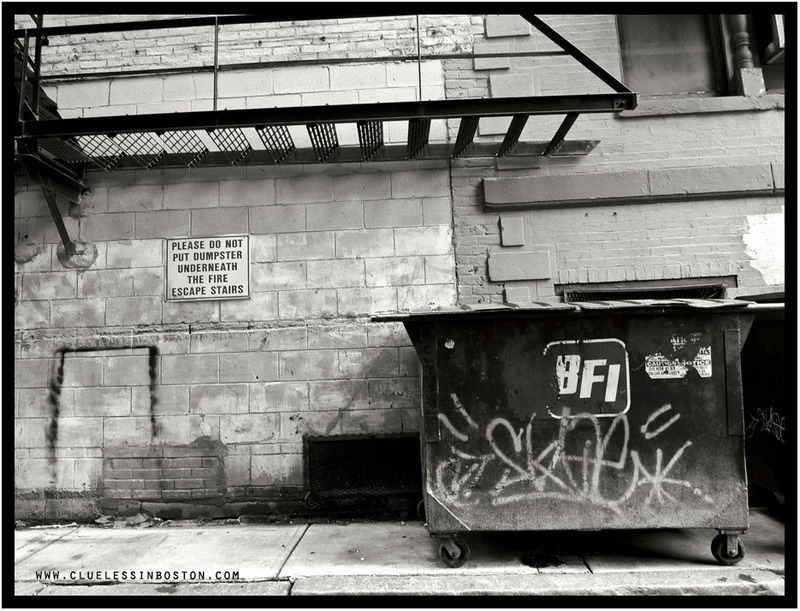 Good bit of urban b&w; not sure if the dumpster guys read the message too closely. You did a nice job making an everyday scene look artistic, like the tones in this one.